The Mix is where it all comes together. Plan your day to the “tee” or make it up as you go at this all-encompassing lifestyle hub. You never know what fun you’ll stumble upon at this Texas-sized mix of amenities. "The Rolling Stone" Food Truck - Click here for menu & hours! 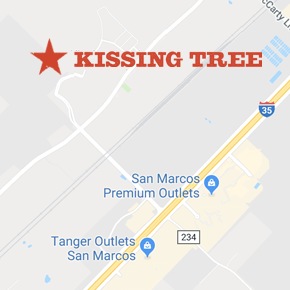 We love our tribes here at Kissing Tree. They bring everybody together, connect us to a larger story and provide the basis for forging deep friendships. Tribes are a vital part of our community. The Kissing Tree Golf Club is an 18-hole semi-private golf course with preferred tee times and rates for the community residents. The course serves as an extension of the natural landscape, blending grades on the edges and bringing the slopes and contours of the landscape into fairways. For more information, please call 512-749-1250.